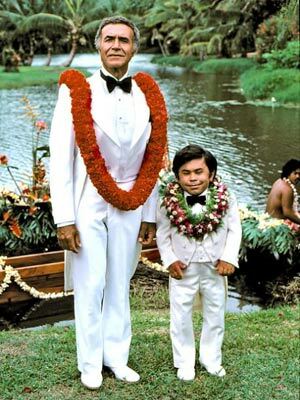 Ralph Reed, Fantasy Island and Dengue Fever? Well, there's a bit of drama here in French Harbor. First, I found out we just missed a celebrity encounter with the National Review Republican Cruise, which docked in Roatan very recently, on the way to the Cayman Islands (natch). William Buckley, Jr., Jonah Goldberg, Cal Thomas, a slew of former Bush, Romney and Reagan staffers, and most famously (or notoriously, depending upon your political view), none other than the Christian Coalition's Ralph Reed spent a day at the Fantasy Island Resort, which is only a few feet from where Espiritu is anchored. By the way, if you're not sure who Ralph Reed is, then I might tactfully suggest that you get out more. After I heard that they had already come and gone, I imagined the scenario of strolling down the beach and passing a guy, and turning to Chris and saying: "You're gonna think I'm crazy, but that guy back there playing with an iguana looks EXACTLY like Ralph Reed..."
And then we both would have laughed, moved on, and that would have been that. Yes, they sell medicine for "the symptoms of Dengue fever" at the local mini-mart. Yikes. And by coincidence, only last night we watched the Stephen Soderberg movie "Contagion," about a worldwide extremely fatal epidemic. Gwyneth Paltrow succumbs to a virulent virus in her death scene in "Contagion." The virus in this movie is WAY worse than Dengue Fever. It's like the Ebola virus on steroids. OK, OK...so by coincidence, I've got a fever today. Big deal. I'm sure it's nothing, and it has absolutely nothing to do with Dengue Fever. And anyway, even if it IS Dengue, there is no treatment. You usually just let it run it's course. But before you freak out (Mom! and Dad! ), I'll monitor myself closely and head to the perfectly adequate hospital here on Roatan Island if I should worsten. You KNOW the hospital is good, because Ralph Reed's people would not let him hang out here if there was not access to top notch medical care. The bottom line with Dengue Fever is this: unlike the fictional virus that ate Gwyneth Paltrow's brain in the movie, Dengue is usually self limiting. So no worries, mate! And the last bit of drama involves the cruisers here in French Harbor. Our anchorage is surrounded by one of Roatan's world famous reefs. The reef is also a "Marine Park," which means there is no fishing allowed. No "taking" of anything at all. 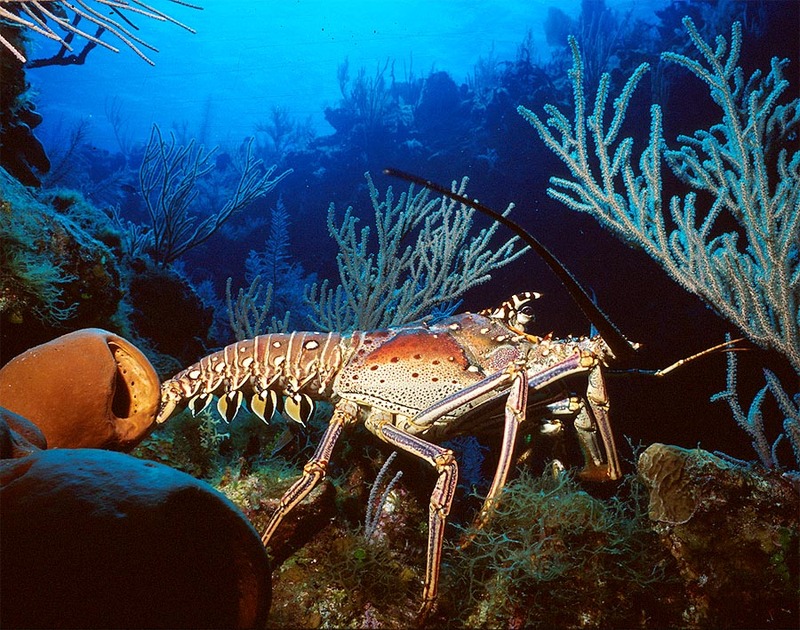 Our reef here comes conveniently stocked with dozens and dozens of Caribbean spiny lobsters. We all admire the lobsters when we snorkel here, and we may even manage to lick our chops as we do so, which is quite a feat considering we have snorkel gear in our mouths. During the morning VHF cruiser's net, the net controller "outed" a cruising boat which was boarded by the Roatan officlals and caught red handed with 20+ lobsters aboard, and a few red snappers shot through with a speargun for good measure. This cruising boat had recently left the harbor for the other side of the island. We were all shocked and saddened that these people would do such a thing. They seemed like nice enough people. Well, the very next day, this boat returned to French Harbor and anchored again, but this time dropped anchor RIGHT on top of the reef. 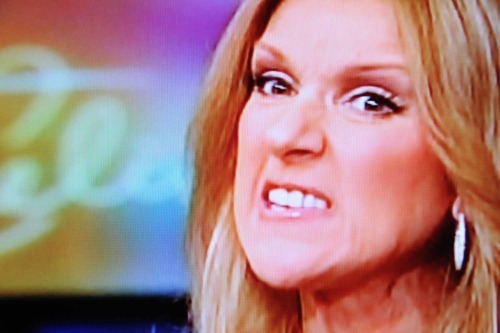 I really don't know what to make of Celine Dion. She's all over the map. She does have an amazing voice, though. But my point is this: She's French Canadian. So do with that information what you will. So anyway, our local French Canadian cruisers come to all of the events acting like nothing happened, but people are pretty upset about it. They're sailing a nice Beneteau, so they're not poor. And this island is filled with unemployed, impoverished families who would love to take the lobster and red snapper, but they don't. Because they respect the law. but will instead have rice and beans. Again. But other than that, it's been a nice, relaxing holiday week here in French Harbor. But I'm keeping my eyes peeled: what new and interesting thing will we see next? The biggest, shiniest Christmas tree on Roatan is on the cruise ship dock, which is blocked off from the local population. Here the tree sits unattended as there are currently no cruise ships in Roatan harbor. Kinda seems like a sad waste to me. Well, it's Christmas Eve aboard Espiritu. I've gotta say that this year I'm missing my family back in the states a bit more than I did last year. Christmas 2011 in Mexico was a magical experience. Mexicans are unabashedly religious -- unabashedly Catholic -- and Christmas in La Cruz was a feast of sacred and joyful celebration. It's just different here. More laid back. I mean, we're in the Caribbean now. It's no big deal, mon. But I've gotta say, I kinda MISS the big deal! One rather sweet little laid back Roatan Christmas tradition is they hammer out little sheet metal Christmas decorations and hang them from trees by the side of the road. This one features an agouti, a sweet little tail-less varmit that is ubiquitous throughout Central America. So, since I'm in the Caribbean now, I've gotta get used to the "laid back, no big deal, mon" thing. I dunno. It's gonna be a tough sell. On the other hand, thanks to our friend Rob aboard Freedom's Call we now have 150 Jimmy Buffett songs on our iPod. I never was much of a Jimmy Buffett fan. Previously, the only song I knew was "Margaritaville," which if you look at the words is a kinda sad song. But after listening to a few dozen of his tunes, I think I'm becoming a convert. There's a wry intelligence to the lyrics that I simply never knew was there. And since I've been in the Caribbean, I'm even learning to appreciate reggae for the first time. But let's face it: since we don't smoke pot, a "Reggae Christmas" has limited appeal. Call me old fashioned, but I like having Christmas MEAN something. And here in paradise, it's kinda uncool to apply too much MEANING to things. It's far cooler to just hang loose, man. So, this Christmas finds me seeking meaning here in paradise. LOL... the journey continues! Chris and I have been in Roatan, Honduras for almost 3 weeks now, and we've finally gone below the surface. Diving here is spectacular, and we're fortunate to have our own gear and a dinghy to get us there. All we need do is just go. Earlier today, Chris and I had just finished lunch aboard Espiritu when we heard a call for help on the VHF. There was a diver in distress on the reef only a couple of hundred feet away from our boat. Chris and I jumped in the dinghy and headed over. Chris dropped me off and went for help in the dinghy. I did CPR for 45 minutes on Tony. Tony from New York. Tony in his dive gear, with his wife holding him helplessly as he lay dying. Doing CPR on the reef wasn't easy, but I gave it my best shot. Tony died today, doing what he loved. He and Marilyn were married for 45 years. Only this morning they were beginning an idyllic SCUBA vacation in paradise. Now she's sitting alone in a hotel room thousands of miles from home trying to figure out where her life goes from here. Life and death. They are everywhere. Mostly what we have seen on this adventure is life, life and MORE life! While the situation is tragic and sad, Marilyn said without a doubt that she was happy he died doing what he loved. They think he had a heart attack, by the way. So, for you and me, the only possible lesson is to live each day fully. And I plan on doing just that. What other option is there? I knew going into this trip that the experience would give me the chance to examine my life in another culture and another place, and move beyond what I know. in ways I can only begin to understand. in the middle of a raging squall. We enjoyed a bit of good, downwind sailing during our passage. Chris had the opportunity to fly both the jib and the staysail at once! And look at the cute, antiquated Port Captain first aid station! Once we were all checked in, we were free to roam and explore the island. We finally pulled ourselves away from lovely but pricey West Bay to explore the other parts of the island. Let's meet some of the locals, shall we? posed for the shot. Note the Las Vegas t-shirt. This little piece of work rides shotgun with her dad in his taxi cab. NOT wear a seat belt, nor does she sit in a car seat. Welcome to Honduras! Little princess as seen from the back. Note how she rocks the bunny backpack! Although we've finally escaped the overwhelming rain and lightning of the Costa Rica/Panama rainy season, it still rains alot here in Roatan. This photo shows the lack of consistent drainage. This is the view from the same spot looking north. Far below is the one golf course on the island. Check out the headgear of this little guy we tripped upon. He's about 3 inches from stem to stern. Cows in the front yard? Welcome to Honduras! While there is alot of money on this exotic island, the majority live simply in dwellings like these. Our French Harbor anchorage is right next to Little French Key, seen above. Cruisers can visit this gorgeous little island for free, as long as we buy food and/or drinks. Sweet! Wall decoration at the local shrimp fisherman's dock. Well, alrighty then! 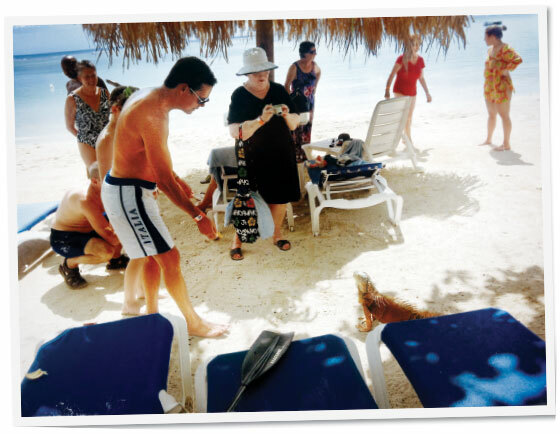 As has been true throughout Latin America, the locals and expats have been incredibly gracious. Our new friend Ed, an American who has lived here for 30 years, invited us to his waterfront home for a dinner of freshly caught Honduran shrimp. Ed's living room. There's no fighting it. Fox News is everywhere. about leaving Roatan anytime soon? We'll be here through the holidays. Wishing you the Merriest of Christmasses, wherever you find yourself on our small, blue planet this year. Thinking of you with love and a tinge of longing. But we are happy, and so very grateful to be here.